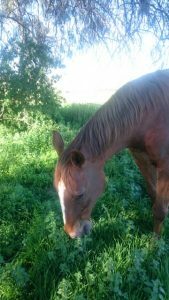 Can horses “Self Medicate” on Pasture? Yes they can, but the diversity and selection of plants in that pasture will govern how successful it will be. 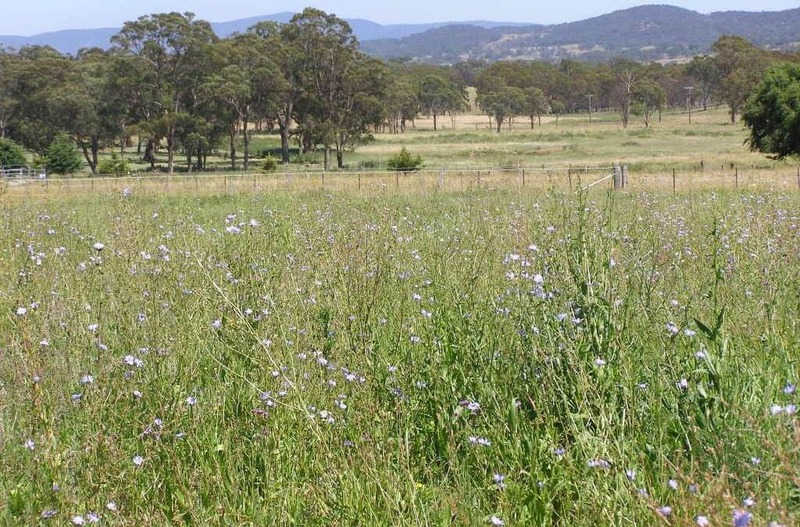 A few decades ago a quality horse pasture would have had around 70 species of grasses and herbs growing in it, and it would have had the humus in the soil carefully built up to maintain fertility. Now pristine looking emerald green pastures, very high in sugars, with not a weed to be seen, maintained with repeated chemical fertilisation at one end of the spectrum, with over grazed, compacted soils with depleted minerals and a high likelihood of poisonous weeds at eh other end of the spectrum seem to predominate. Neither are beneficial to the health of the horse. So sub-optimal conditions simply cannot create pastures which will give horses the opportunity to self medicate. Horses in the wild had access to a great many different grasses and herbs to select from depending on the season. They would have also browsed on bark, twigs, berries and flowers. Although the horse’s dentition classifies it as a herbivore (grass eater) it still maintains the habits from its ancestry as a small tapir like creature which liked to browse. Horses have an innate ability to self select foods and medicines which was vital for their survival in the wild. So provided they are not too sick to be able to sense their own needs, this genetic inheritance will come to the fore given the opportunity. Medicinal herbs are classified in several ways – by family : by physiological function and by molecular structure. The chemical compounds in plants is what confers the physiological effects in human and animal bodies. This chemical composition is incredibly complex. The major functional groups are acids, alcohols, alkaloids, anthraquinones, bitter principles, carbohydrates, coumarins, essential fatty acids, flavonoids, glycosides, phenolic compounds, saponins, tannins and essential oils. Let’s take a look at some of the groups and what they do. These oils are especially abundant in the aromatic plants such as Thyme, Peppermint & Rosemary. The horse’s highly developed sense of smell can easily detect these oils in aromatic plants, even if the leaves are just brushed against but especially when they are crushed. All essential oils have unique properties but they also share some common actions, they are all antiseptic and they act both locally and on the whole system because their molecules are very easily transported and distributed throughout the whole body. Most plants contain a degree of essential oils and one of the most interesting is the pungent smelling, wild Carrot, which has powerful healing properties. Tannins cause an astringent action both on the skin or on the mucous membranes. They act locally and are generally not absorbed by the digestive tract. Therefore they can reduce scouring or internal bleeding and are useful in the treatment of burns and wounds. Yarrow is used both internally and topically. Barks and clays often contain tannins and these will frequently sought out by horses. Regarded as the “goodies” in most plants, glycosides yield various sugars, such as the muscle sugar glycogen, essential for existence. A good example is Hawthorn Berry, much sought after by horses. The naturally occurring unsaturated fatty acids have vital functions and must be supplied by the diet. Sunflower seeds provide linolenic acid, flax seeds provide alpha-linolenic acid. Horses love both these seeds. All have the valuable effect of stimulating the secretion of all digestive juices and hepatic activity. 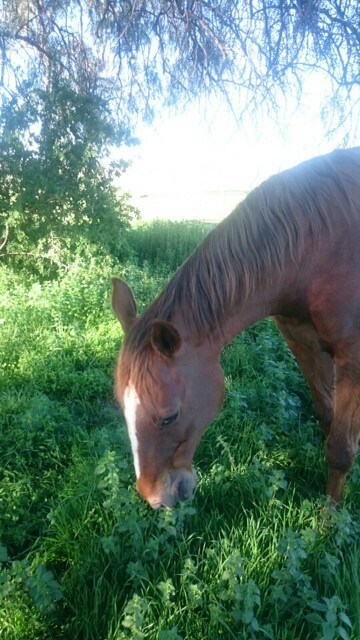 Horses love bitter herbs and given the opportunity will partake freely of them. Two good examples are Dandelion and St Marys Thistle. These are a large group of phenolic plant compounds, many are coloured (yellow, red or blue) with sub-group names of flavones, bio-flavonoids , isoflavones and flavonoid glycosides. Most importantly they act as anti-oxidants with free radical scavenging ability and anti-inflammatory activity. Dog Rose (rosehips) is a good example, also one of the highest plant sources of Vitamin C.
Usually found either as sugars or starches, but also s cellulose which can bond to produce pectin, gums or mucilages, which are complex carbohydrates contained in soothing and healing herbs such as the demulcent Marshmallow, which is important in the treatment of gut ulceration. Phenolic compounds may be a simple or a complex combination of a range of basic molecules. One of the simple phenolics is Salicylic Acid which is often found in combination with sugar, forming a glycoside, as in White Willow, Crampbark, Wintergreen and Meadowsweet. 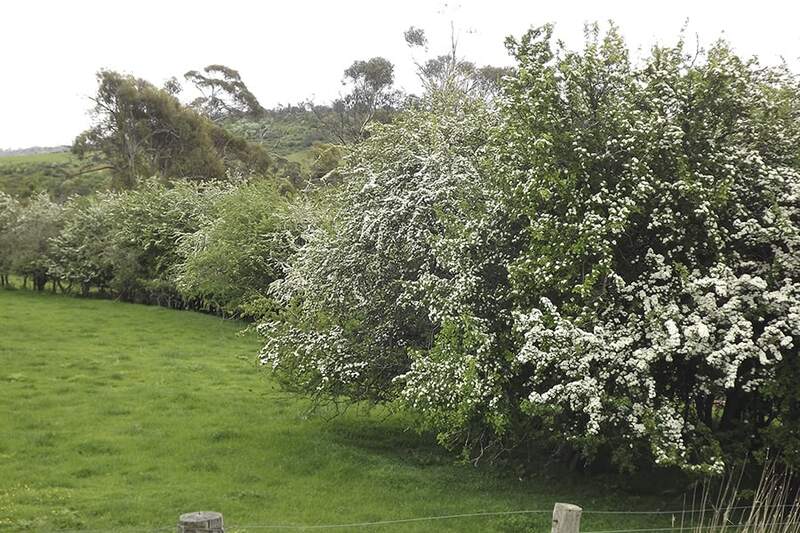 A client of the author had a very sick paint stallion which was encouraged to self medicate on White Willow, amongst other herbs, and she had to cut it for him and take it to him, and he ate four ute loads over a period of about 10 days. Salicylates are common in pasture plants – including Yarrow, Red Clover and Alfalfa. Meadowsweet is one of the best herbs for healing gut ulceration. 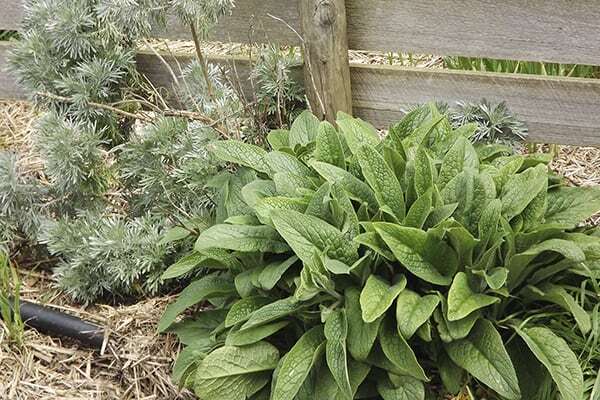 By gaining a basic understanding of these plant compounds, herbs can be selected to provide specific physiological activities in the equine body. Secondary compounds found in some plants protect both the plant and the animal eating it by providing anti-microbial agents for example. On the other hand, some plants contain compounds which act as anti-feedants and which protect the plant and prevent horses and other animals from eating them. Unfortunately there are a number of plants poisonous to horses where this does not happen. So it is important to carefully select plants when creating a self medicating pasture. One is also limited by the region as to what plants are going to do the best in that environment. When thinking of this it is important to realise that there are thousands of herbs which grow in greatly differing regions all over the world, from the mountains to the sea and the desert. Obviously it is impossible to re-create the wild scenario even on very large properties, so let’s look at some ways to create the opportunities for horses to self medicate. One is to create hedgerows : the second is to revitalise pastures : the third is to create a small field or large yard as a medicine yard & the fourth is to create a medicinal/culinary herb garden. Fields or paddocks can be divided up this way by starting with bramble type plants such as blackberries, dogroses, hawthorn, which are medicinal in themselves but which also provide shelter for smaller softer plants to grow underneath, such as Clivers, Comfrey, Chamomile, Calendula, Yarrow, Garlic, Dandelion. Leys can be created by dividing strips off with electric fencing and planting the desired herbs in that area, with access available once they have grown by simply removing the electric fencing for a time. Plants with long tap roots such as Alfalfa or Chicory are excellent for brining nutrients up from deep below and softening compacted soils, improving fertility and also providing valuable forage. Red Clover and Plantain are two universally useful pasture plants and thistles of all kinds are loved by horses. French White Millet with its high silica is also a great favourite. It is fascinating to watch them eat the purple flower heads ever so carefully avoiding the thorns, demonstrating their instincts to seek out what they need. Brambles and dog rose can be grown over the perimeter fence with a mini hedgerow underneath then a selection of pasture plants in the middle. Fenugreek and Nettles are two herbs with excellent nutrient profiles, but Nettles need to be wilted, dried or boiled into a soup to pour over the feed, as the sting prevents horses from eating them in their raw state. Bitter anthelmintic herbs can also be used in all these scenarios especially Wormwood (Artemesia absinthium)which is also a good hedging plant. This is ideal for aromatic herbs such as Rosemary, Thyme, Oregano, Sage & Peppermint, which can also be used in your home kitchen. These can be picked and offered to horses individually to see what they like and can then be added to the feed or used to make washes and poultices, where these are needed. Taste testing is a great way to see what your horses need. It is important to carefully observe each horse’s reaction upon being offered a fresh herb, a dried herb or even an oil. Put the horse in a small yard or stable and stand on the outside so she can walk away if not interested, responses vary from wanting to eat the whole lot all at once, or a cursory sniff, or an exploratory taste. Also they might not want it one day but will on another day. Don’t forget to use a selection of grasses as the basis for your medicinal pastures, such as fescue, cocksfoot, phalaris, timothy, prairie grass. This will depend on your environment. This way you will get the best mix of feed and medicines and your horses will thank you!